This was the 2nd year my husband Ben and I organized the event and we couldn’t believe that 56 happy mountain bikers joined in on the fun. This was more than double the amount of riders from the previous year. I was excited and nervous to be 1 of the 16 girls taking part, and it was the longest mountain bike ride I’ve ever attempted. 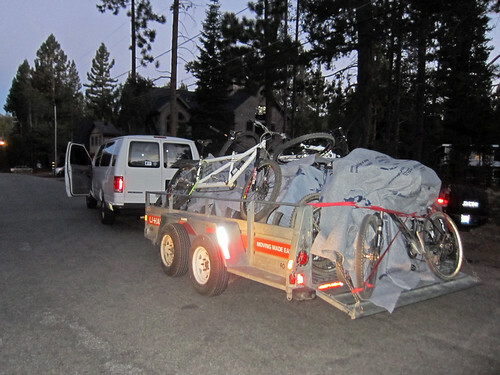 When I moved to South Lake Tahoe 10 years ago, never in my wildest dreams did I imagine riding my bike from Mt Rose to Toads in a single day. There was a time when just looping Toads was an all-day epic for me. How­ever with each year my rides have gotten longer. I was also comforted by the thought that I could bail out at one of many lovely trails that would bring me back home (Van Sickle, Star, or Armstrong). 6:00 am: Most riders met at the Oneidas parking area for the morning shuttle. We did our best to hand out snacks and maps and make sure everyone had what they needed for the long day ahead. 6am shuttle all packed up and ready to go. 7:15 am. We arrive at Mt Rose and everyone im­mediately rushes out of the shuttle vans and heads to the bathrooms. 7:30 am. Quick group photo and we’re off! We left with an enthusiastic energy and new friendships seemed to form immediately. I liked chat­ting with people I had only known through their internet personas. Rose to Spooner is also a welcom­ing fast-paced warm-up. 9:30 am. The first SAG stop was at Spooner Sum­mit and I was a little disappointed to have a bit of a sad belly already. That damn fruit punch Gatorade I thought. 10:50 am. Time for a short break at the Bench, a group photo, and then on to one of my favorite parts of the ride down to Kings­bury. 12:10 pm. 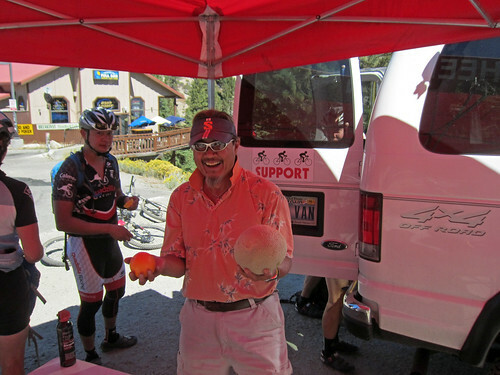 Kingsbury SAG stop where I consumed a ridiculous amount of orange slices from Curtis Fong. I am very chatty and could have stayed there all day, especially after seeing a few of the riders who were bailing at Van Sickle downing cold beers. 2:40 pm. Trailside rest at the beautiful Star Lake which is one of my favorite spots in the Tahoe Basin. It was hard not to drop down right there at the new super fun Star Lake Trail as some other people had planned. 3:20 pm. 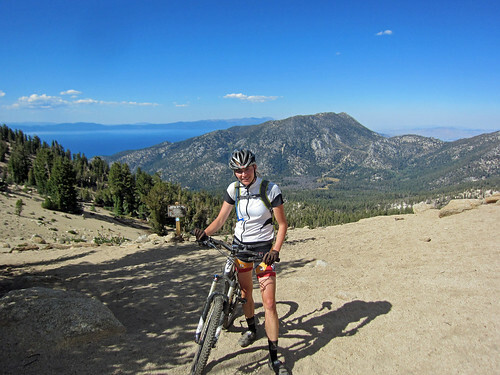 Climb to Freel Peak and the highest point of the whole ride near 10,000 feet above sea level. Collected myself for over a ½ hour at the top. Freel Peak Pass, nearly 10,000 feet above sea level, this hurts! 4:35 pm. After another climb out of Armstrong Pass all of the climbing finally was done! But oh my belly was in bunches. I told Ben that I hurt. He said, “It’s a hard ride. You should hurt!” That’s tough love for ya. 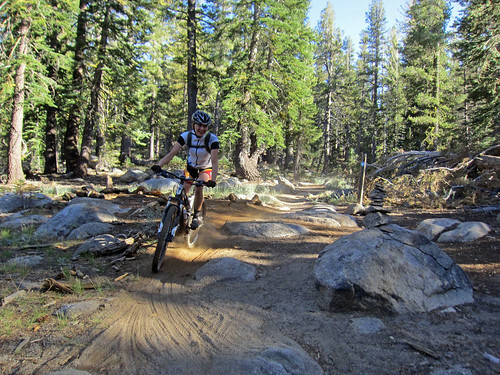 All of the pain in my belly went away as soon as we started riding the Rim Trail down towards Toads. I love that section of trail and as soon as we got to Toads I was smiling once again. I found out that no matter how tired you feel, Toads is still the most fun you can have on 2 wheels. All smiles before entering Toads! 10 ½ hours and 62 miles later I was done and back to Oneidas. I was grateful to have the rare opportu­nity to go for an all-day bike ride with my awesome and encouraging husband. This was a great ride to end the season, literally, since a few days later I found out that the pain in my belly was not from fruit punch Gatorade, but from a double hernia! Despite that, I can’t think of a better way to end the year and I can’t wait to do this ride again. See everyone on the next Rose to Toads Ride!